So why did I finally make Summer Pudding? Because I had this wonderful Artos Fruit Bread that was starting to go decidedly stale, even after eating slices for breakfast each day. Not wanting to waste any, I remembered the pudding that uses specifically stale bread. All I needed was the fruit, the summer fruits usually consist of a mixture of raspberries, blackberries and red currants but can also include blackcurrants and strawberries. Not having time to go to the farmer’s market, I had to make do with the supermarket to find all my ingredients. Each one of these ingredients was going to cost me £2 a punnet. A very expensive dessert. Thankfully I found a bag of mixed summer fruits in the freezer section, though it’s a shame to not use fresh fruit for the few months its available locally, needs must. 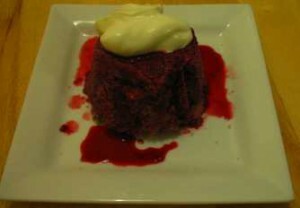 As I have never even tasted a summer pudding before, let alone made it myself, I wasn’t really sure to expect. 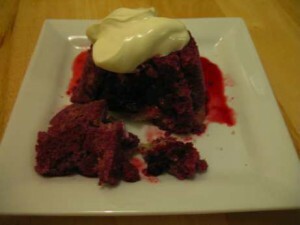 I did some research online to get the general idea: David Lebovitz’s Summer Pudding and BBC Foods Individual Summer Pudding. After looking at these and others it seemed fairly simple, so I didn’t really follow any particular recipe. All it seems to be is: cook the summer fruits in water and sugar (I used agave syrup). Separate the liquid for later. 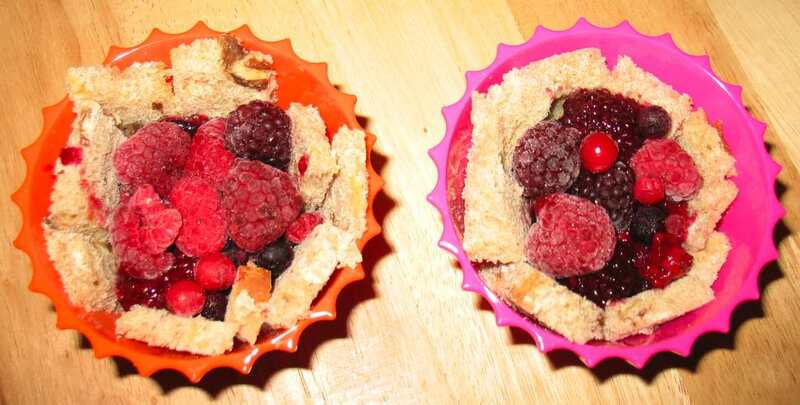 Thinly slice the stale bread, and fill the individual ramekins. Add the fruits. Add bread tops to the ramekins. Weigh down in the fridge over night. Serve with the reserved liquid. In the end I am glad I decided to only make two individual summer puddings, rather than one huge one (most recipes seemed to serve 8 people). Don’t get me wrong I loved it, however The Other Half didn’t. I have to admit I was (and always am) disappointed when he doesn’t like something I make – I can always tell. Then he’ll take one or two bites. Then it’ll sit a bit longer. (At this point I tend to start becoming a little crazed, trying to work out whether he’s just busy or purposely avoiding it). “If you don’t like it just leave it”. I try not to sound annoyed or too disappointed, as it’s not his fault if he doesn’t like it, sometimes people just don’t like things. “It’s just too tart”, he says. He has got a point. It’s very tart but I love it. I think some kind of accompaniment is necessary to counteract some of the tartness, creme fraiche was perfect for me, but vanilla ice cream or whipped cream would go down well with this dish, and possibly better for The Other Half.